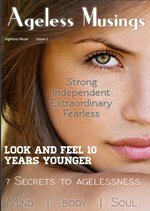 What is A Hydronic Heating System Expansion Tank Cistern? 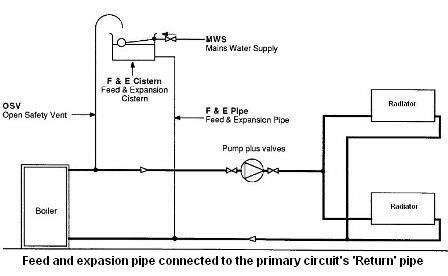 What is A Feed And Expansion Pipe? Where is The Feed and Expansion Pipe Located? 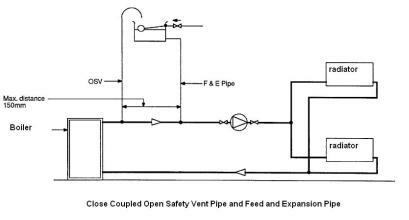 What is A Open Safety Vent Pipe? Where is The Open Safety Vent Pipe Located? How High Should The Open Safety Vent Pipe Be Above The Tank? A hydronic expansion tank is the vessel that feeds water to your boiler and heating system in an open vented central heating system, and accommodates the expansion of the system's hot water. Only open vented systems (open to the atmosphere) require a heating system expansion tank (cistern). In unvented - sealed heating systems - the expansion of hot water is taken up by a sealed expansion vessel. 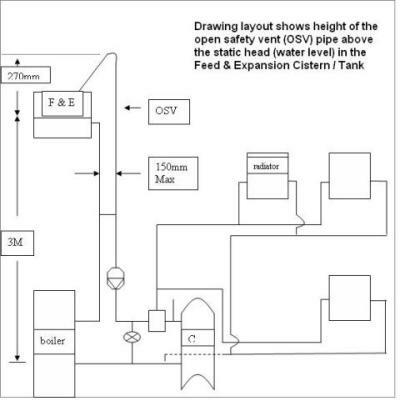 The above drawing shows the relevant water levels in a feed and expansion cistern. Keep the boiler and system filled with water at all times to prevent overheating of the boiler. Water is fed to the boiler via the feed and expansion pipe. A feed and expansion pipe (often referred to as the cold feed pipe) is the pipe connecting the hydronic heating system tank to your boiler. Water is fed through this pipe on commissioning to fill the system and also to permit water when heated up to expand to the hydronic heating system tank above. The feed and expansion pipe of the hydronic heating system tank also has to assist the 'open' safety vent pipe in the event of your boiler overheating. Your boiler heats this water which is then circulated through the 'primary circuit' of pipe work to heat the water stored in your hot water cylinder, or to heat your radiators, or both. The water stored in your cylinder is provided by a separate cold water storage cistern and this water is distributed via the 'secondary circuit' for domestic use and is independent of the water in the 'primary circuit'. 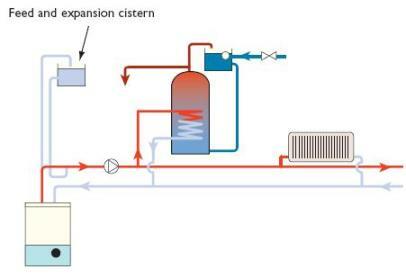 The image above shows the feed and expansion cistern supplying the boiler and primary circuit, the secondary circuit is provided by the cold water storage cistern for domestic use. The feed and expansion pipe is located at the second branch or 'Tee' on the primary circuit 'Flow' pipe from your boiler and is connected on the side and 25mm from the base of the hydronic heating system's expansion tank (in some older designs the feed and expansion pipe was connected to the primary circuit 'Return' pipe). It is very important that the water supply from the feed and expansion pipe to the boiler is not interrupted because the heat exchanger within the boiler will get extremely hot if empty of water and can be seriously damaged. The main function of the open safety vent pipe is to enable steam and water to be safely vented away from the boiler into the hydronic heating system expansion tank in case of an overheat emergency. Very little expansion of hot water takes place in this pipe. The open safety vent pipe is located at the first branch or 'Tee' on the primary circuit 'Flow' pipe from your boiler and should rise continually and terminate above the hydronic heating system expansion tank. This type of pipe connection is called 'Close Coupled' as the open safety vent pipe and the feed and expansion pipe are connected to the primary circuit no more than 150mm (maximum) apart. 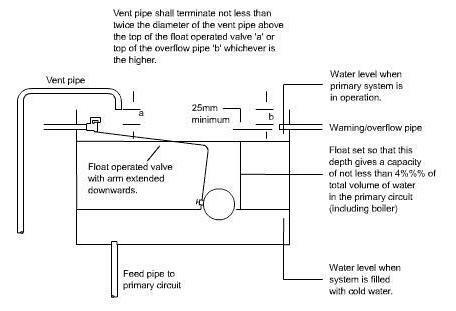 The height of the open safety vent (OSV) pipe above the hydronic heating system expansion tank can vary depending on the building's dimensions i.e, the distance between the highest and lowest water level points in the heating circuit - but there is a formula for working it out. The height is the distance from the 'static head' (the water level in the hydronic heating system tank) to the lowest point of the heating systems circuit. For example, let's say that the distance between the static head and the lowest point is 3 meters. 270mm would be the height that the open safety vent pipe has to rise above the water level in the hydronic heating system expansion tank when the system is cold. Although many people call these vessels 'tanks', they are, in fact, 'cisterns' i.e, they are open topped with lids and not tanks which are closed for example like an oil tank. An overflow warning pipe connected 25mm below the ball valve. This pipe should run independently and discharge externally in a conspicuous place (where you can't miss it). An open safety vent pipe firmly fixed in place to discharge just below the lid through a purpose designed fitting (or a neatly drilled close fitting hole). A firm framework to support the height which will give it an adequate static head over the heating system.